I've always been fascinated by words and their graphic possibilities. My word drawings were the result of purchasing several inferior sketchbooks that, while unacceptable for drawing, seemed to be perfect for the short strokes of letters. That was the start. I have since made paintings that furthered that exploration. This series combines my love of words with a layered matrix that evokes mystery, obscurity and ambiguity. The words in the drawings and paintings are free associated and touch upon popular culture, history, literature, music and geography. 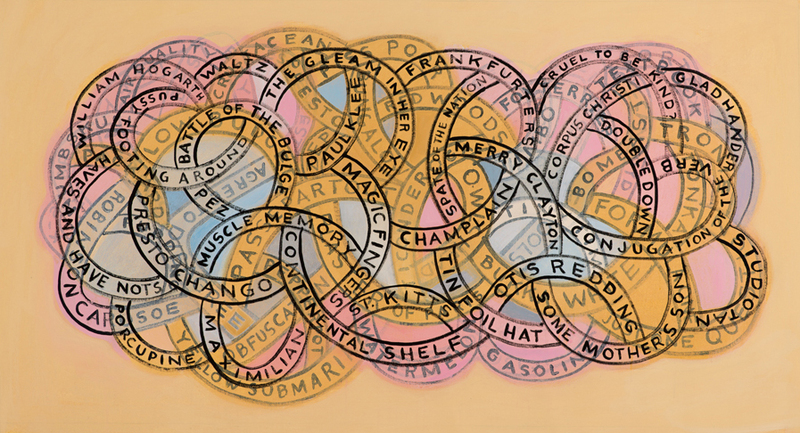 Similar works can be commissioned to reflect the vocabulary of a particular client. Click on thumbs for galleries.